We’ve been hearing about potential problems among the cast and crew of The View throughout the 2014-2015 season, but today a hilarious story emerged from the set. Earlier this week, Whoopi Goldberg returned from a sabbatical due to a back injury. On Tuesday, she brought an ergonomic chair to support her back post-injury. Yesterday, all of the women used the same chair, but producers felt they looked clunky, so they yanked them from the set. Well, they yanked all but one from the set. Check out the amusing image, below. If you’ll notice, this still from Wednesday’s episode has Rosie O’Donnell and the other members of the panel in chairs with short backs. With the short chairs, the focus is on the bodies of the people speaking rather than on a giant lumpy chair that is pretty distracting. Unfortunately for The View producers, Whoopi Goldberg is sticking to her guns and continuing to use the giant office chair during filming. According to TMZ this is probably just going to be the score from now on, so producers are going to have to figure out whether to let all the ladies use the ugly matching chairs or try to camouflage Whoopi’s chair somehow. Maybe they could cover it in stickers featuring The View logo? At least that would be an eyesore with branding. I can’t even imagine the hilarious conversations that have been going on behind-the-scenes on The View. But the outlet is reporting that Whoopi needs the chair following dealing with a herniated disc in her back, and there’s not much that the show can or should do about the chair should the daytime talk show host need and want to keep it in the coming months. The “chairpocalypse” is the least of The View’s worries right now. The ABC series changed to a new lineup this season, with Goldberg left as the only veteran on the show’s staff. The new lineup hasn’t done much for the show’s ratings, although the show has basically stayed steady in the ratings. However, there have been reports from the set that numerous hosts have not been particularly happy with the way the new season has been going. Earlier this year, the rumor mill indicated that Rosie O’Donnell was unhappy with her position on the panel. More recently, various outlets reported that new host Rosie Perez would be quitting. The latter is currently taking a hiatus from The View to work on a Broadway production. Regardless of the behind-the-scenes chatter, it’s unlikely that we’ll find out what The View has in store for next season until this spring or later. 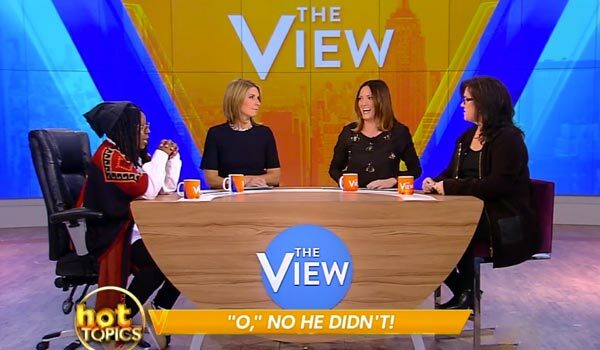 The View has been on the air since 1997, and it has weathered controversies, catfights and ratings battles many times before. We’ve seen ungraceful exits and firings in the past, and it looks like there could be more exits in the show’s future. In short, an ergonomic chair is the list of the show’s worries, although it makes for an amusing image.